Hello everyone, how are you all doing today? 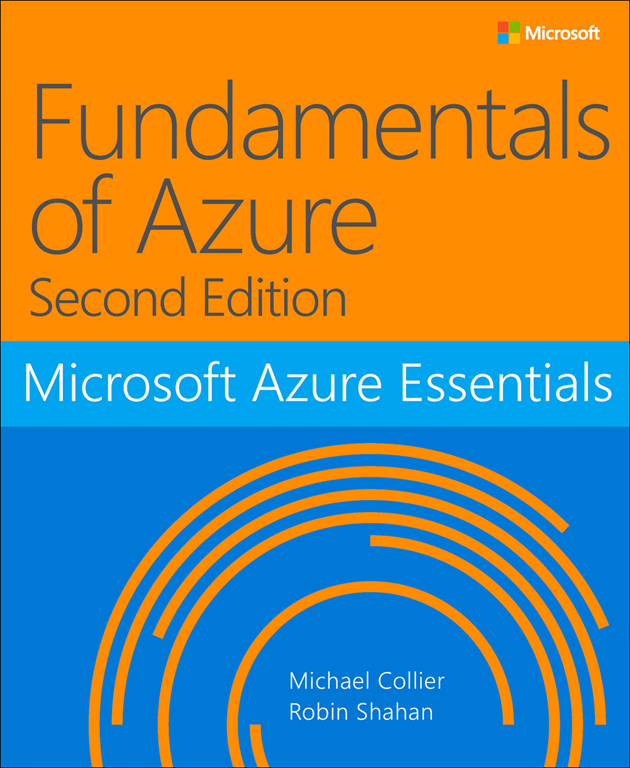 We now have the Microsoft Azure Essentials: Fundamentals of Azure Second Edition eBook available for download, and yes, it is 100% free thanks to Microsoft’s Michael Collier and Robin Shahan. Michael S. Collier is currently a Senior Software Development Engineer in the DX TED Commercial ISV team at Microsoft, and previously served as a Cloud Solution Architect. Robin E. Shahan has over 25 years of experience developing complex, business-critical applications for Fortune 100 companies and now works for Microsoft as a Sr. Content Developer for Azure Storage. This underrated book covers the fundamentals of Azure you need to start developing solutions right away. It concentrates on the features of the Azure platform that you are most likely to need to know rather than on every feature and service available on the platform. This book also provides several walkthroughs you can follow to learn how to create VMs and virtual networks, websites and storage accounts, and so on. In many cases, real-world tips are included to help you get the most out of your Azure experience. In addition to its coverage of core Azure services, the book discusses common tools useful in creating and managing Azure-based solutions. The free premium eBook contains much more information regarding Azure Essentials so go ahead and download it from our personal server and let us know what you think in the comments. What Does Azure Essentials: Fundamentals of Azure, Second Edition Cover? Getting started with Azure: Understand what cloud computing is, learn about Azure Resource Manager and Role-Based Access Control, visit the management portals, learn about billing, find out how you can contribute to the Azure documentation and code samples. Azure App Service and Web Apps: Learn about the Azure App Service, consisting of Web Apps, Logic Apps, Mobile Apps, API Apps, and Function Apps. We will focus on Web Apps and how they work with the App Service and App Service plans, covering the topic from deployment to monitoring and scaling. Virtual Machines: Explore the basic features of Azure Virtual Machines, including how to create, configure, and manage them. Storage: Read about the basics of Azure Storage, including blobs, tables, queues, and file shares, as well as some of the options available such as Premium Storage and Cool Storage. Virtual Networks: Learn the basics of virtual networks, including how to create one, and why a virtual network might be necessary. This also covers site-to-site and point-to-site networking, as well as Express Route. Databases: Explore two relational database options available in Azure: Azure SQL Database and SQL Server in Azure Virtual Machines. Azure Active Directory: Explore basic features of Azure AD, including creating a directory, users and groups, and using the application gallery. Management Tools: Explore three common tools for working with Azure: Visual Studio 2015 and the Azure SDK, Azure PowerShell cmdlets, and the Cross-Platform Command-Line Interface. Additional Azure services: Get an overview about Azure services not covered in the book that may be fundamental to you now or in the future, such as Azure Service Fabric and Azure Container Service. Business Scenarios: Explore five common scenarios for utilizing Azure features: development and test, hybrid, application and infrastructure modernization, and Azure Mobile Apps, and Machine Learning.